Add presence to firm or home's interiors with photographic prints of Wall Street's skyscrapers, sculptures, seaports, and institutions. This is an extraordinary book about the most important financial center in the world. Included are interior views and biographical sketches of every major institution. Included are extensive captions that enable you to open the book to almost any page and find something you did not know before. 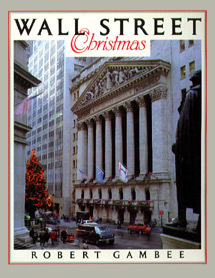 272 pages and over 300 color plate, with gold-embossed red linen binding, Wall Street Christmas represents publishing of lasting quality and value; a true collector's book.